Alamance County is located in the Piedmont, between the Triangle and Triad regions. The county seat is Graham, but the largest city is Burlington. The county is the site of Elon University, a private liberal arts college. In Alamance, only Burlington lends support to Democratic candidates. Burlington is less white than the surrounding areas and boasts a rapidly growing Hispanic population. The outlying rural areas are much more Republican and typical of most rural areas in the Piedmont region. A number of prominent NC political figures came from Alamance County, mostly Democrats. They include Senator B. Everett Jordan, and the Scott family: former Governor W. Kerr Scott, his son Governor Bob Scott, and granddaughter, former Agriculture Commissioner Meg Scott Phipps. Forecast: Alamance is not as Republican as it used to be. The rapid increase in the Hispanic population along with growth in urban areas has put the county more in reach for Democratic candidates. 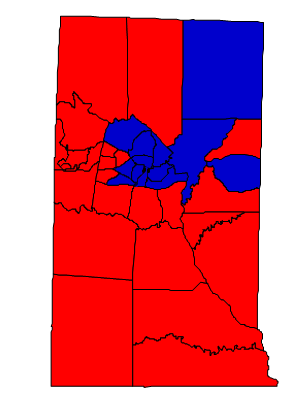 But Alamance is still solidly Republican, and in a close contest Republicans will carry it with ease. The difference is that while Republicans used to carry the county with upwards of 60% of the vote, now that represents something of a best case scenario. The growth rate from 2000 to 2010 was 15.54%, which is above the national average. The white share of the population is diminishing; the Hispanic population is now 11% and is 15% in Burlington. These trends favor Democrats, but the county slightly trended Republican in 2012.